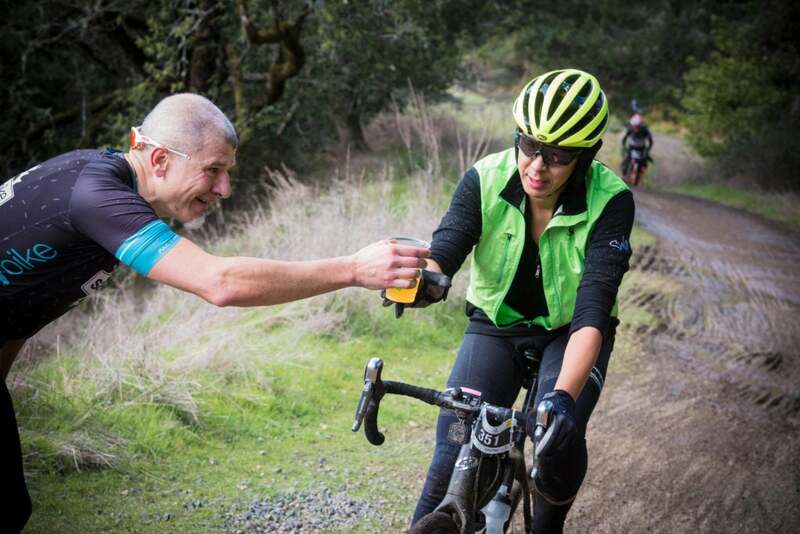 While the professional peloton was starting its season in far-off places like Australia, Argentina and Europe, a group of former pros, weekend warriors and cycling enthusiasts began their cycling season this past weekend in Northern California with the epic, season-opening Grasshopper Adventure Series: a unique blend of road and gravel racing. Starting in the picturesque town of Occidental, in the heart of Sonoma Valley, the Grasshopper is celebrating its 20th anniversary this year. And this first event—“Old Caz” as it is called—makes its way up to Cazadero before swooping back down toward the finish at the summit of Willow Creek Road. But what was found in between on this 52.3-mile course included paved roads, gravel roads, single-track paths and even a challenging river crossing. Some clearly came to the event to race, while others just came to ride. But everyone at the start last Saturday was in a festive spirit. 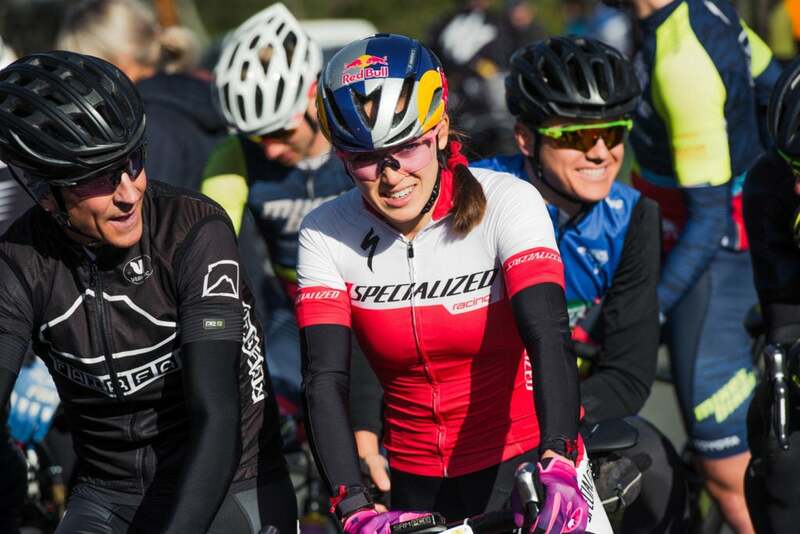 Local pro Kate Courtney was just one of a handful of professionals on hand at the start of the “Old Caz” Grasshopper. On the front line it was easy to spot one-time pros like Levi Leipheimer and Ted King, along with current pros such as Courtney, all visibly fit. But, further back, riders of all levels of experience could be seen. And some even used the event to make fashion statements all their own. Taking off in Occidental, the pack quickly climbed Coleman Valley Road before making their way up Bohemian Highway toward Cazadero. And if such place names don’t resonate quite like the Oude Kwaremont or the Arenberg Forest, fear not, as you are not alone. The truth of the matter is that for many years the Grasshopper was one of the region’s best-kept secrets. But today that secret is clearly getting out, because what was once little more than a group ride now boasts more than 600 official starters. 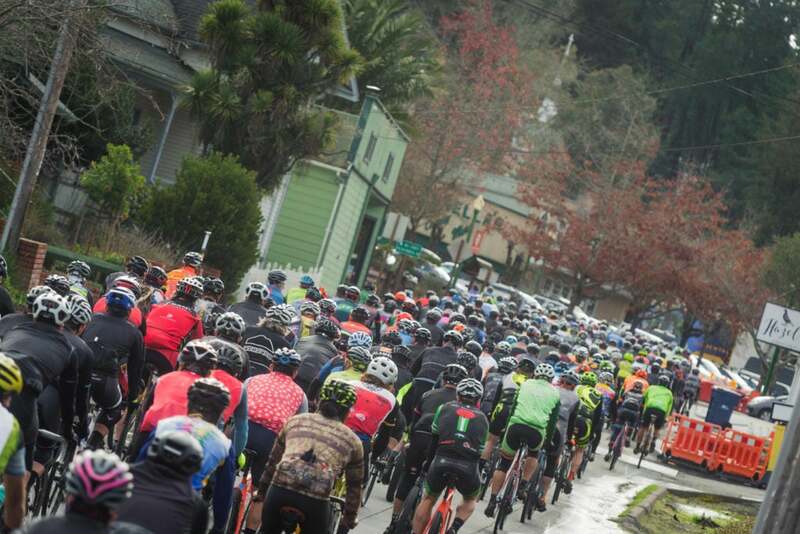 The 600-strong peloton rolls out of Occidental, California, for what promised to be a grueling 52.3-mile course. 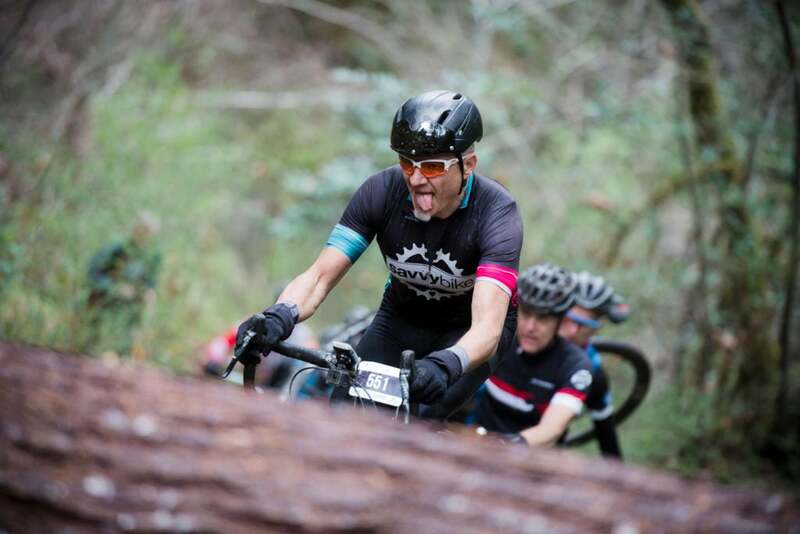 The “Old Caz” ride forces everyone to dig deep. 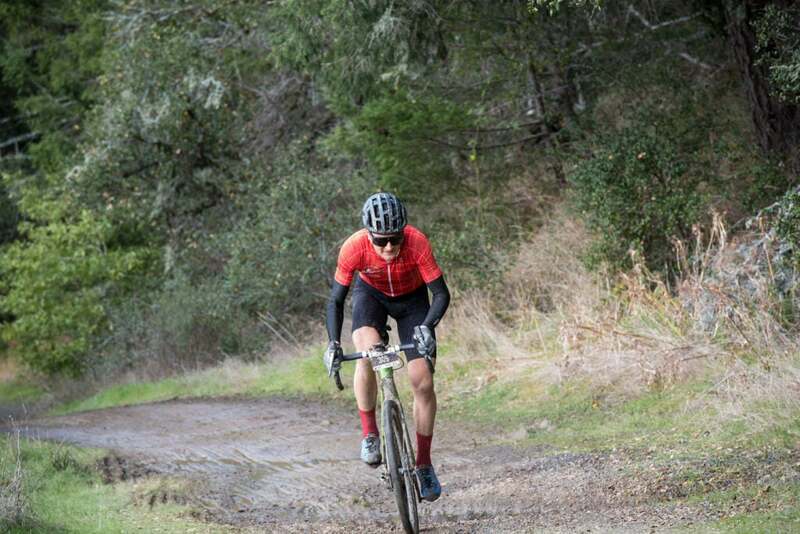 As the riders approached the much-anticipated river crossing, somewhere between Cherry Street and Old Cazadero Road, King and Leipheimer appeared locked in a tight duel. The river crossing is roughly at the halfway mark, but clearly the race was already taking its toll as the pack was stretched out for miles. Yet despite the increasing levels of exhaustion, spirit appeared high. There was no consensus as to how best cross the river. For some the water was cold, while for others it was warm. Little matter, the river crossing is clearly a landmark in the event, not to mention a moment in the day that is discussed by everyone long after the finish. 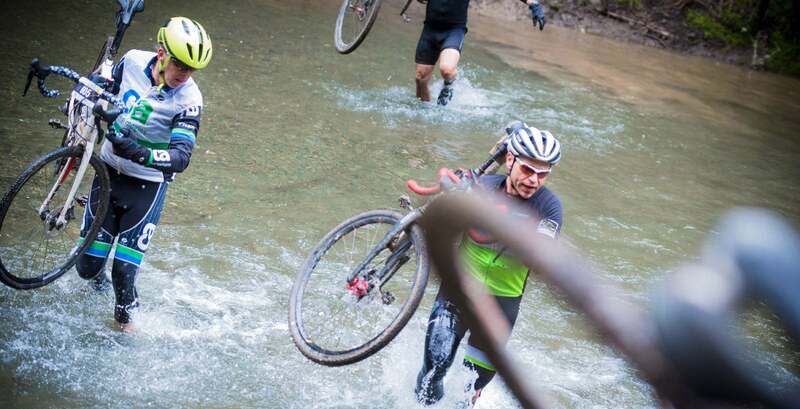 Levi Leipheimer navigates through the feared river crossing. Still looking like a pro, Ted King powers toward the finish, and to bragging rights as the winner of the 20th Old Caz Grasshopper. And while the two former pros dueled through much of the first half of the race, King eventually opened up a lead on Leipheimer, who, returning from a ski accident, faded gently to fourth by the finish. But then considering that top prize was a bottle of wine and a water bottle, any results here were mostly about bragging rights. King, who has moved from New England to Northern California, enjoyed the warm sun after the hilltop finish, greeting many of the other finishers, who he knows on a first-name basis. Clearly King has been accepted into the Grasshopper community. This finisher apparently had more than just the final place and time on his mind as he crossed the line.